Find the best place to stay in Siem Reap to visit the temples of Angkor Wat! 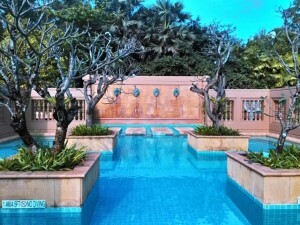 You have planned a trip to the magical temples of Angkor Wat and are looking for the right place to stay in Siem Reap? Thankfully, that’s easy to do and inexpensive compared to other major tourist destinations. There are plenty of choices at any budget and with the typical, friendly Cambodian service, you should have no problem finding a hotel to enjoy. Read on for tips in what area to stay! If you like the idea of walking to restaurants and bars at night or wander the markets, you can stay in the heart of Siem Reap with plenty of hotels and guest houses in walking distance from bar street with all its evening entertainment. Siem Reap is a very safe town and you can be comfortable to walk at night. I recommend to hire a driver for your temple sightseeing, so there is no point in staying “close to the temples” – you will be driving around anyway! There are plenty of small guest houses with rooms for under $30 in town, many offering basic, good accomodation. You get friendly service at any price point, so it is a much better proposition than in many other tourist destinations. You’ll also find some very nice, independent boutique hotels in tow that offer upscale accommodations at good prices. I’ve stayed at the Rambutan Resort and enjoyed the stylish rooms with outdoor bathtub on the balcony, nice pool and good breakfast. It’s a short walk from town. The Park Hyatt Angkor is a luxury hotel right in town – it’s one of the most expensive and also most highly rated hotels in town, so you get what you pay for! The Le Meridien Angkor is located halfway between the town and Angkor Wat. It’s often available at competitive rates and as a category 2 hotel you can stay for as little as 3,000 SPG points on weekends. I have stayed there twice and had a good experience each time. You can read my review here! The Sofitel Angkor is on the same road from town to Angkor Wat as the Le Meridien and priced between the Hyatt and the Le Meridien. Other than the three chain hotels above, you’ll find a number of independent luxury hotels that can offer a spectacular stay. The Shinta Mani Resort is one of the most highly rated hotels in Siem Reap on Tripadvisor and should make for a great experience. I haven’t stayed there (yet), but you can check out other reviews here! The competition is stiff in Siem Reap and you can find lots of great value options, if you are flexible with the location. Because you will need a driver to explore the ruins anyway and local transport is readily available and inexpensive, the lcoation of your hotel matters less than in most other tourist destinations (read all my Tips for Getting Around). There are a number of large, new hotels in the area that cater to tour groups and offer great deals when they are not that busy. You’ll also have small, independent hotels that are a little further from town. Both can make for great deals, so I recommend to check Tripadvisor to find the highest rated hotel at a bargain price for the time of your stay! 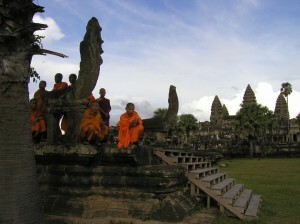 Angkor Wat is one of my Top 5 Historic Destinations and it should be on your list of places to see. With so many hotel options at any budget and many good value hotels vying for your business, you should be able to find something to your liking and have a great pad to explore the grand temples of Angkor!